Bradley, Fern Marshall, and Barbara W. Ellis, eds. 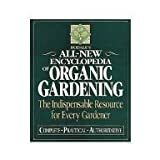 Rodale’s All-New Encyclopedia Of Organic Gardening. Emmaus: Rodale Press, 1997.